2011 is wrapping up. Amongst other things that means I am getting ready for my annual trip to the wilds of Wisconsin's driftless region to stay in a cozy farm cottage with beloved friends and family. It will be my daughter's first experience of this little tradition and I am counting the minutes! New Year's Day I will make a painting of it, and that painting will be offered up in a little giveaway here on Tiny Aviary. If you wish to be included in the drawing, please leave a comment on this post. You do not need to leave your full name unless your google/blogger identity is very common like "John". Tutto capite, amici? Ok, I wish you health, happiness and warmth. Be kind to each other and the critters with which we share this planet. I'll be back to check on you peeps in 2012. 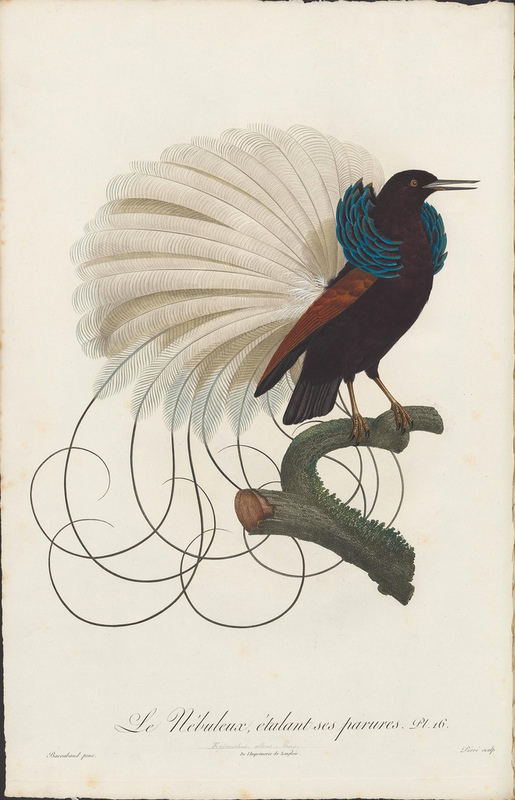 I will NOT be giving away this sublime bird-of-paradise print, but this one and others can be viewed here. Thanks to my lovely friend Aaron for pointing them out. Have a wonderful trip, and a very happy new year. Thanks for the chance to win! Have a great trip & a happy new year! Happy New Year and I hope you have a wonderful time on your trip! Oh yes, please enter me in the giveaway. Best wishes for a happy new year and lots of bird sightings! Thanks for having a giveaway! I would love to win a painting of a pigeon, as long as it was done by you! Have a wonderful New Years and give yourself and family hugs from me. Am I disqualified? If not, I want in on the action :-). Hooray Wisconsin! Hooray first bird of the new year! Absolutely not, but I will have to find a way to hide all of the WI birds from you on NYD. Happy Holidays, Diana, your art's looking beautiful! Happy New Year to you and your lovely family. Safe travels! Can't wait to see what bird it will be! Happy new year to all! Have a very happy new year! I can't wait to see your first bird painting. Thank you for the chance to win it! Please enter my name in the hat! Enjoy reading your blog and interesting stories. Can't wait to see what bird you will draw. Thanks for the opportunity to win. Happy New Year! Gargantuan fan of your work. I'm a big fan and when I met you a couple years ago you were very nice. Hi Diana. I've been perusing your work lately and thought I'd jump on this opportunity. Hope you guys are well. Happy New Year and have a great getaway. A happy and prosperous new year to you and yours from one side of the globe to the other. Thanks for the contest! Enjoy your time away. Happy New Year! i still think you should bring your beloved friends and family to our house for new year's, even if it's not wisconsin. happy new year, diana! thanks for sharing through your always thoughtful and inspiring blog! @brink: I will not join your cult! Amazing giveaway. I admire your birds paintings so much! What a wonderful magical giveaway. I love the tradition of painting the first bird you see. I would be honored if I won, thanks for such a lovely giveaway. Here's to new year's traditions. Have a wonderful trip. Getting cozy in a cabin sounds great but I'll be spending part of the first day of 2012 at a wildlife preserve helping people see and learn about it's wetland inhabitants. Can't think of a better way to spend the 1st. Hopefully some Sandhill Cranes will be hanging around in our vicinity. I do love them. Have a wonderful trip with your little girl, not sure what birdies you might see in Wisconsin?? But I will hope I might win... I may see a Blackbird if I shake the seed when I feed the birds, he comes for the raisins which I throw under the shrub for him :) Not so easy to paint, Blackbirds! Happy New Year! Hope I win :)! oops, I was on my mom's laptop and I think I used her Google account. I hope this works with mine now! No problem, but I did remove the previous comment so I don't mistakenly enter you in the drawing twice. Thanks! What a lovely idea! Happy New Year! I am prepared for new and amazing things to happen to me this year! Have a nice trip and keep safe. Happy New Year to you! Thanks for the giveaway. I hope to see my first bird before April - they all flew south! Thank you so much ! What a cool way to come up with a painting and awesome giveaway. I've loved reading your blog over the last year Diana. Thank you for this chance to win one of your beautiful paintings. A very Happy New Year to you! Have a great trip and a fantastic New Year! Happy New Year !!! Keep up the beautiful work !! Thanks for the chance at your work !! Happy New Years! Great giveaway! Just got back from KS where Canada Geese were everywhere. It made me miss home. I would love to be included. Happy New Year! Beautiful work! Happy New Year, and thanks for the opportunity! Quite a few bird sightings in Florida- and the gifts were well received. Happy final hours of 2011. I'm originally from Toamh, WI "where the I divides" and "cranberry country. So how far from the Dells and Baraboo will you be? Will you be able to go and visit the Crane Ranch? I would love to win one of your paintings. Thank you and have fun in WI! Guessing it'll be a chickadee this time around... Happy New Year! Happy new year and great work! I love your tradition of painting the first bird you see on New Year's Day! Have a wonderful trip wih your family. What a lovely idea. Enjoy your trip and happy new year! Best wishes for a joyous New Year's and many blessings in 2012. Happy birding tomorrow. What a wonderful giveaway! Thanks and a happy new year to you! Have a terrific trip and a happy and healthy New Year! Just discovered your blog via a link on Geninne's art blog from 2008. 2012 is already starting to shape up well knowing I have another great art blog to view. I would definitely LOVE to enter such a delicious draw! Happy new year, and thanks for always posting such interesting things! Your blog is a wonderful way to get my study skin/ornithology fix. Oh, what a wonderful idea! I love your work and I can't wait to see what your first bird is. I hope it's not too late to enter. Birds are my solace and joy and I love your artwork. Wishing you a joyous New Year! Comments closed now, folks! Thanks!